This took place while walking up the hill in Itiyuro in search of the macaws. See my earlier post. For a change I spotted this little fellow running and then lost it when it stopped. After a while searching it moved again at the time that we were almost about to abandon our search. I am sure that you will find it. Just in case you did not spot it, I took a couple more pictures as it was really a nice youngster although we could not identify it. We try to get our farm house’s surrounds as bushy as possible by planting as many trees, shrubs and plants as they would grow. We have had many failures as last years we had severe frosts that took care of many of the tender trees we planted such as jacarandas, bombax, fig trees, olives and others. Luckily the past two years have been benign in terms of temperature and we have witnessed an almost luxurious growth of almost every seedling we have planted. Knowing the place, we are ready for the next bad winter that will even things out again! In the meantime we are enjoying the Crataegus and Cottoneaster in fruit at the moment that are attracting several species of fruit-eating birds such as the Plush-creasted jays (Cyanocorax chrysops) and the occasional Toucan (Ramphastos toco)! 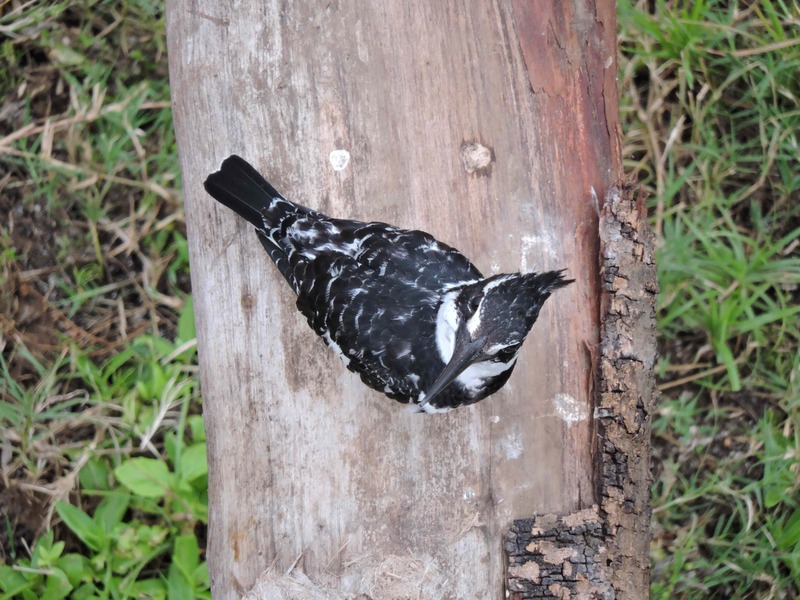 Apart from plants we have placed several artificial nests that have been occupied at various times by different occupants such as House wrens (Troglodytes aedon), Saffron finches (Sicalis flaveola), Sayaca tanagers (Thraupis sayaca), rufous-bellied thrushes (Turdus rufiventris) and others. As bats were seeing perched under our verandah, we also built a couple of houses for them after Googling for modern designs. We also feed the birds and the Plush-creasted jays are constant visitors to the feeding plates together with the Rufous-collared sparrows (Zonotrichia capensis). In addition we also have the visit of Gray-necked wood-rails (Aramides cajaneus) that have a running battle with the plush-crested jays for the dominance of the plates. Despite their rather small size the Rufous-collared sparrows are by far the cleverer though. They are fearless of humans and although the jays let you realize when the birdseed is finished the sparrows come to let you know that they are hungry! This year they overstepped the mark and for the first time they dared to come inside the house in search for food. I knew that they were known for doing this at the rural kitchens in Uruguay but it had not happened at our farm yet. One evening we heard strange noises near the place we normally seat to read and talk and to our surprise a sparrow was walking about the house, tic, tic, tic their small jumps on our dry cow hides while walking about in search of dead or dying moths, an abundant source of food at our house as they tend to mass in the lights during the night and enter the house all the time. After chasing and feeding on moths for the first few days, the bird discovered the small container with broken maize seeds that I used to fill the bird feeding plates, the bottom half of a large soda bottle. It did not take long for it to get inside and pick the best morsels! After a couple of days of visits, a second bird came and the pair went straight for the kill, getting inside the maize seed container without any delays. They are now so confident that they either walk in or even fly in and out of the house depending on their desire for food! They have also got used to enter either from the back or front doors or, if they so wish to fly through the house avoiding us at the last millisecond but giving us some frights by brushing themselves against our faces!! They are now part of the household inhabitants and we hardly noticed them, except when the time comes to clean their tiny droppings from the floor. Last September, after a few early morning drives at the Kalahari Transfrontier Park, we took it easy for a couple of days, visiting the waterholes late in the mornings and afternoons. The day before our departure from our last camp, Twee Rivieren, I suggested to go for an early drive but my wife preferred to continue relaxing so I went on my own. It was a bad idea as, somehow, the whole camp shared this thought and the only road out of the camp was a dust cloud, despite the 50kph speed limit. Aware that the morning had not started as I dreamt, I drove slowly until I found a waterhole to stay and wait for the travelers to quiet down as it usually happens. I stopped after about 20km at the Rooiputs waterhole. I was alone there and, as expected, soon the traffic died down and I could enjoy some dustless tranquility. Apart from a few gemsbok staying a couple of hundred metres from the water and a lone jackal that was clearly mice-hunting in the dunes at the back, the waterhole had been completely taken over by birds. I spotted a good number of Namaqua sandgrouse on the ground and decided to take a few pictures of them. The trees around the water were laden with small birds, mainly red-billed queleas, sociable weavers and red headed finches among others. There were also a great number of laughing doves and ring-necked doves. The latter were in such numbers that it was like a curtain of moving birds that often obscured the water source as they flew in and out. Hundreds of doves were “queuing” on the nearby trees to get to the water. Most of the time the available water was literally covered with birds and every now and then an explosion of birds flying in all directions followed a perceived threat. Often these were false alarms and the scared birds returned to drink immediately. It was following one of these bird explosions that I saw a tawny eagle in the midst of the doves. When I spotted the eagle it had already caught a dove and it soon landed to eat it. “This is incredibly easy”, I thought and decided to stay there and wait for more action. When it finished eating it flew away but I was sure that it would come for more. It did. Unexpectedly, the eagle did not return at great speed, just flew above the doves, lost altitude and then it entered the “dove cloud” and, almost effortlessly, grabbed another dove with its talons and landed to pluck it and eat it! It all happened too fast for me and I only managed to take pictures of the raptor feeding about twenty metres from me. After eating, the eagle flew away again and landed on top of a nearby tree followed by a large retinue of small birds busy mobbing it. I continued watching the birds’ drinking dynamics when, after about ten minutes, the eagle (or another one?) repeated the operation and, again, caught another dove! After its third dove, the eagle flew to the same tree and then I saw a second eagle. Further inspection revealed that the clever eagles were nesting about fifty metres away, taking advantage of the easy pickings that the waterhole offered them! As they only need to fly a few hundred metres a day to get a full crop and feed their fledglings, I started wondering -like with the Scottish pigeons of my earlier post-about eagle obesity! Luckily, my fears were dispelled as the next time one came for another pigeon it looked really mean and I did not detect any accumulation of fat round its waist! 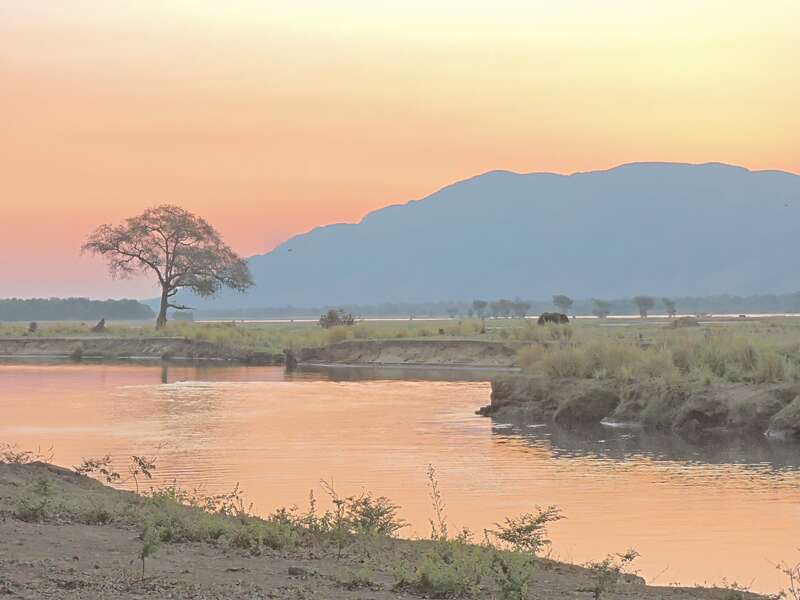 Mana Pools National Park is found in the middle Zambezi valley. It extends from the Zambezi river in the North (Zimbabwe-Zambia border) to the summit of the Zambezi escarpment 50 km to the South. The park includes the river itself, a broad area of acacia and mahogany woodland on a belt of alluvial terraces. Although this is the area where most of the animals congregate during the dry season and therefore the most visited, the Park also includes large areas of mopane and jesse-bush (Combretum celastroides) and the rocky hills that flank the Zambezi valley. The Park and adjacent areas are regarded by many as the finest wilderness area in Zimbabwe. This was our second visit this year as we had been in Mana. At that time it was cold and the animals, particularly the elephants, were still spread around in the park and therefore less abundant by the river. The absence of elephants then was largely compensated by sightings of wild dogs, lions and a leopard near our camp site. This visit was different. It was much warmer and, as the dry season had advanced, the animals were indeed massing in the northern part of the park where water and grazing are still available. We stayed at Chitake One and at Gwaya private camp sites so we enjoyed a true wilderness feeling by being alone. Without doubt the elephants were the main actors during our visit and I hope to be able to describe the various events in an amenable way for you to enjoy. “Mana” in Shona means Four, describing the four pools that the Zambezi river left behind in its meandering. Kruger National Park in August was busy and we just managed to get a couple of cancellations that matched with our son’s visit as well as our annual medical check-up in Nelspruit, a hang up of our days at Maputo. The park, even with low occupancy rates, is normally busy as it offers a large number of beds to the visitors in the various rest camps and other available facilities. For this reason, it is extremely difficult to find a corner where you can be on your own. Imagine how it was in August when the park is full! 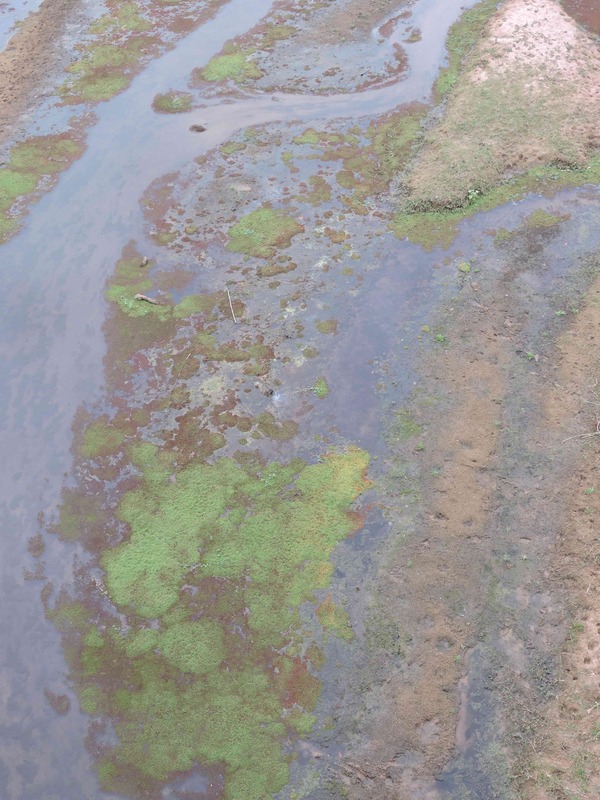 We were aware of this situation and decided to leave the big five for the next visit and focus on exploring a few less used roads and to improve our bird watching skills. In this department, I am pleased to inform you that we managed 99 species, about one fifth of the total number of species of the park! Fishing was not in our plans as this is forbidden in the park. However, we crossed many rivers where wildlife can be observed! 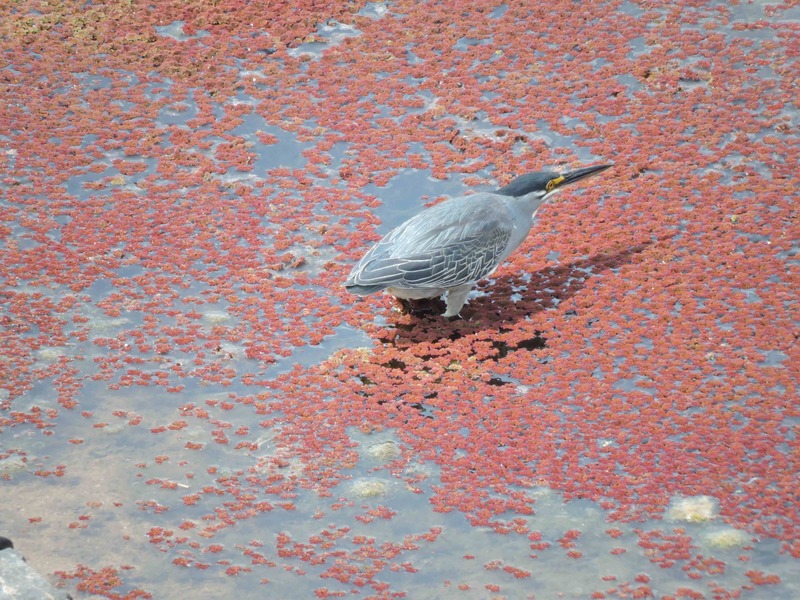 Normally this includes water birds and other creatures that come to drink or nibble tender grass associated with water. So we always stop and watch at river crossings! One of the best places is the bridge over the Letaba River on the H1-6 road where you are allowed to get out of the car and have a look around while stretching your legs. 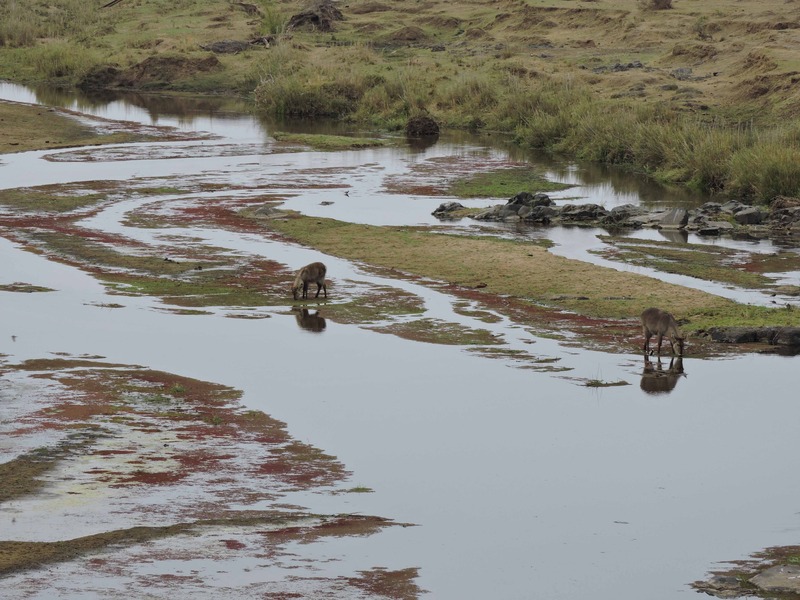 Waterbucks drinking by the Letaba River bridge. We have seen many interesting things in this place so it is an obligatory stop where we usually spend some time. You just need to be patient, unlike most motorists that drive past, some of them quite fast! We surprised this pied kingfisher from the bridge. As soon as we got out we were literally hit by the pungent smell of bats, stronger than we remembered. The stink seemed to be emanating from the bridge’s cement joints, together with the bats’ high pitch calls. Although we tried hard, we failed to see them through the cracks so we investigated the outside of the bridge, also unsuccessfully. We were engaged on this task when we heard splashes in the shallow water so we forgot the bats that were not cooperating and went to look for the fish. The area preferred by the fish. 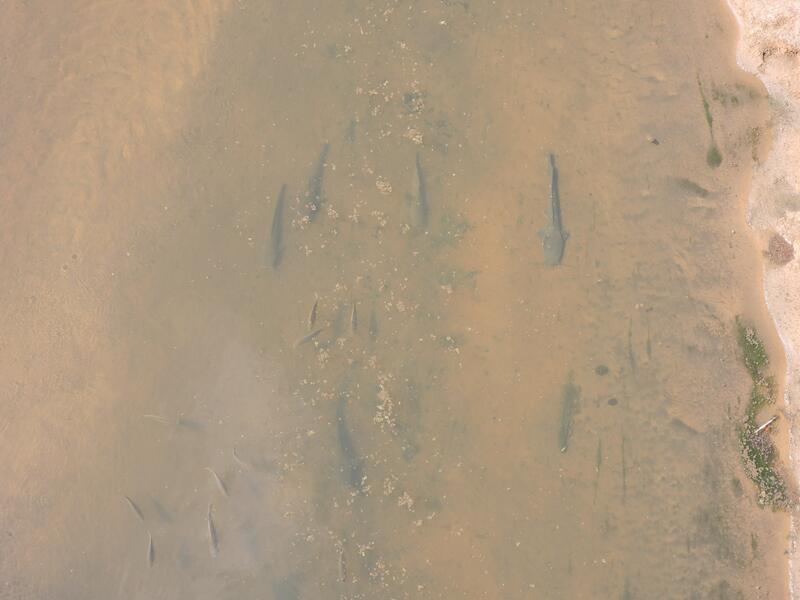 These were shoals of tilapia feeding on the water plants. There were many fish of various sizes. 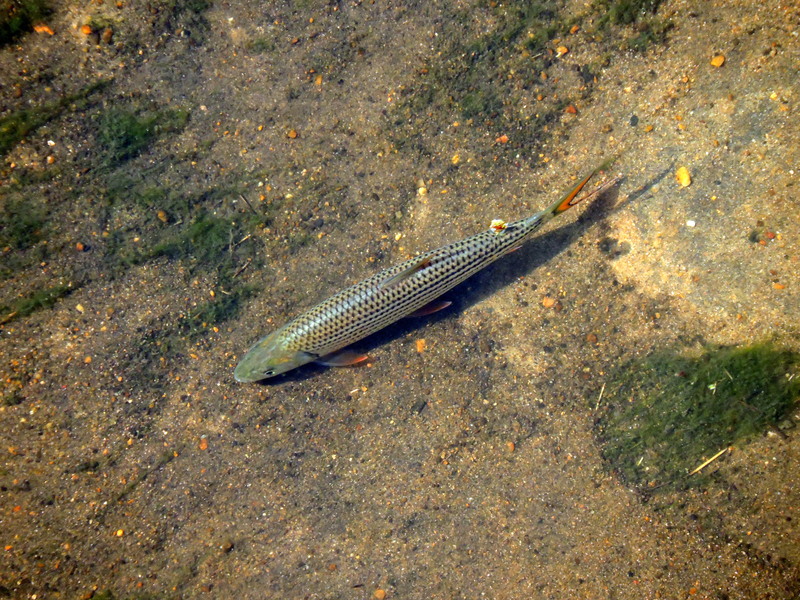 While watching the tilapia feeding we came across a lone and slender fish lying immobile a couple of metres away from the tilapia. It was a tiger fish sunning itself but clearly waiting for prey. Further watching revealed a few catfish as well. The latter were more abundant when we looked at the river on the other side of the bridge. 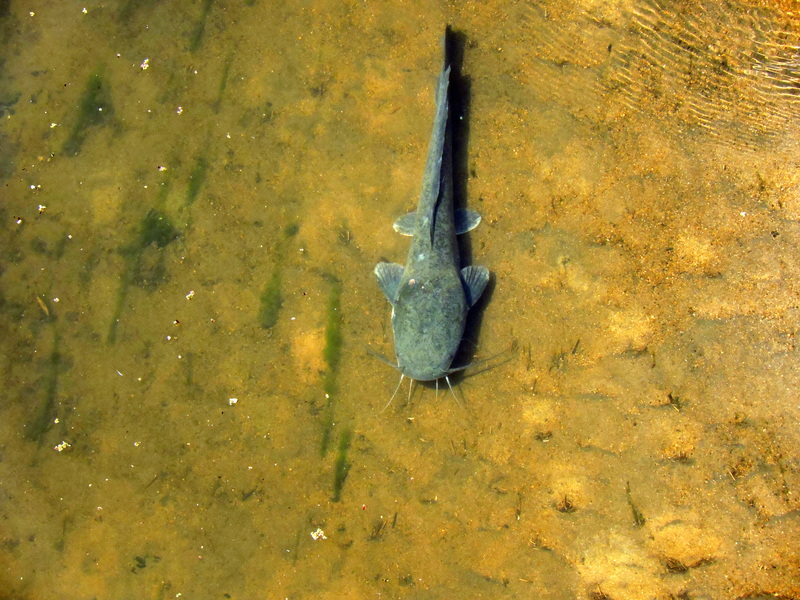 There we saw several catfish of various sizes lying at the bottom of the river, all pointing in the direction of the current and being disturbed by the occasional terrapin passing by. Interestingly, having polarized sunglasses helped me to see the fish clearly while my companions needed to strain their eyes until I decided to share my glasses with them (just before they tossed me over the rails!). Photography was, however, another matter as we did not have a polarizing filter and our attempts at taking pictures through my sunglasses proved fruitless! Despite the bad results, we did take a few pictures that were forgotten in the memory card until we returned to Harare. Then, when sorting out the photos of the journey I saw a bunch of what appeared to be uniformly brown images. 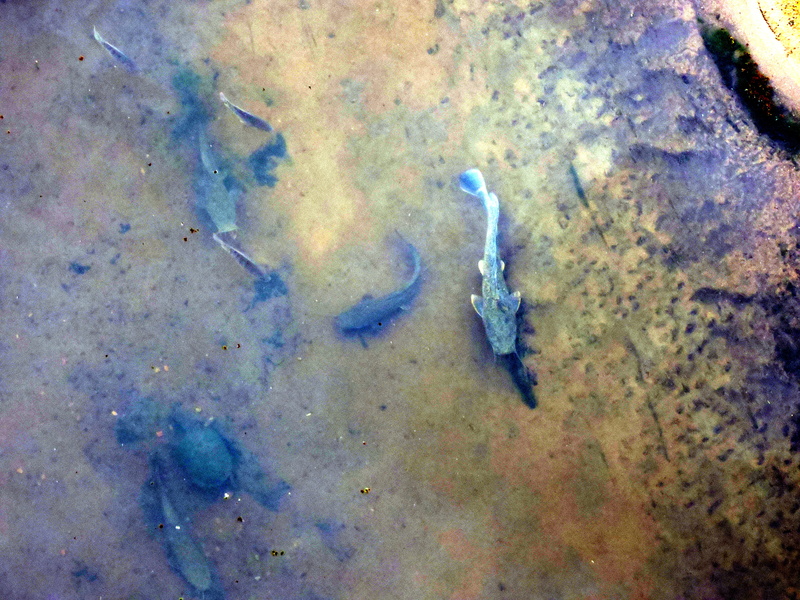 They were our “fish pictures” and the fish seemed to be immersed in murky water and only just visible! I tried a few of the options that Picasa offers and failed. I was about to delete them when I pressed the “I am feeling lucky” option and then as if by a miracle the fish became very clear as if the command would have sucked out the water! I present you with an example of a non processed cloudy picture to show you what they really looked like as well as some of the processed ones as I believe are worth viewing as they are a demonstration that not only the big five are worth watching. The fish to the naked eye. The picture above after the “magic” of Picasa! 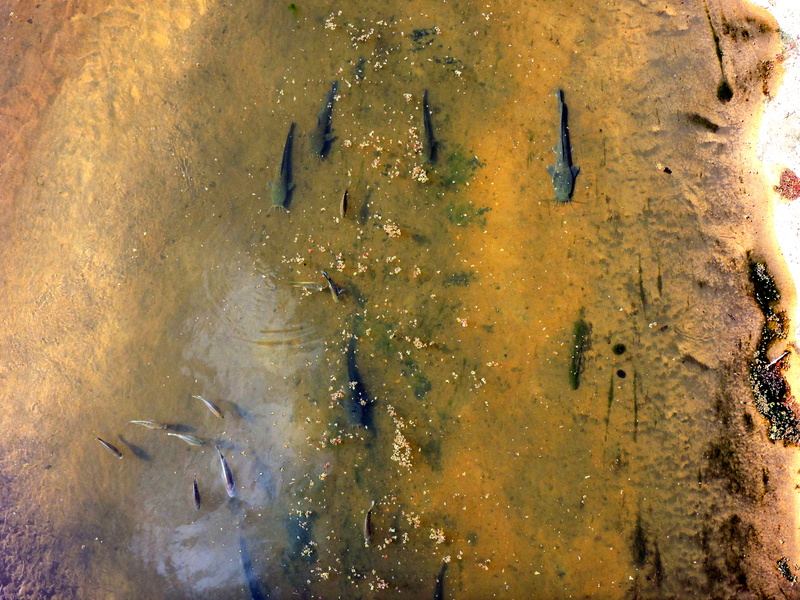 Catfish are seen at the top while the tilapia are on the bottom left. Catfish disturbed by a terrapin. Before I end this post I would like to propose a new group of animals to be seen in Africa: the “Slippery Five”. I propose the crocodile, the hippo, the python, the catfish and the terrapin as its members in an attempt at persuading visitors to pay more attention to the water courses and its inhabitants -both outside an inside the water- in the national parks!